Stop by and enjoy great art by talented artists from the Santa Clarita Artists Association, with live demonstrations each day throughout this event! 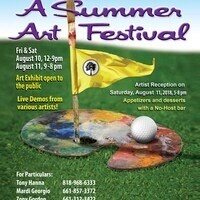 Artists' Reception will take place 5-8 p.m. Aug. 11th, with live entertainment, appetizers, desserts and a no-host bar. The event will display over 100 pieces of art in total.